It takes time to do quality work. Please allow 7-10 business days for manufacturing of your cover. WeatherMax is an 8 oz solution dyed Satura Max. Newly developed Ottoman weave produces a stronger, tighter marine canvas. Breakthrough UV technology results in long terms color retention. Patented HydroMax finish offers superior water repellency and ease of cleaning. Welded seams are stronger than traditional stitched seams. WeatherMax fabric is recommended for mooring, storing, or trailering. This cover is a custom cover for a Sea Hunt 186 Escape (03-10) and is covered under a 5 year limited warranty. Prism is a 9 oz two-ply acrylic coated polyester duck. Prism will not crack, peel, or harden and remains pliable in all climates. Prism has built in UV, mold & mildew inhibitors and is resistant to abrasion and most chemical degradation. Prism fabric is recommended for mooring, storing, or trailering. This cover is a custom cover for a Sea Hunt 186 Escape (03-10) and is covered under a 5 year limited warranty. Travel Tuff is a 13 oz coated polyester. It is designed to handle the rigors of trailering. Travel Tuff is durable and strong, coated for tear & abrasion resistance and a long life. Water repellent, UV resistant, and treated with mold & mildew inhibitors. 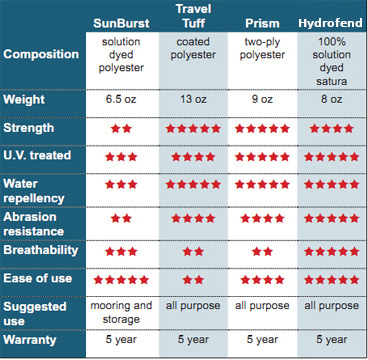 Travel Tuff fabric is recommended for mooring, storing, and trailering. This cover is a custom cover for a Sea Hunt 186 Escape (03-10) and is covered under a 5 year limited warranty. Sunburst is a 6.5 oz 100% polyester duck, designed for marine use. Sunburst is strong and as durable as acrylic duck. It is water repellent, yet breathable. Treated with UV inhibitors, mold & mildew resistant.Sunburst fabric is recommended for mooring and storing. This cover is a custom cover for a Sea Hunt 186 Escape (03-10) and is covered under a 5 year limited warranty. Sunburst is a 6.5 oz 100% polyester duck, designed for marine use. Sunburst is strong and as durable as acrylic duck. It is water repellent, yet breathable. Treated with UV inhibitors, mold & mildew resistant.Sunburst fabric is recommended for mooring and storing. This cover is a semi-custom cover for a Runabout Boat up to 18' 10"×96" and is covered under a 5 year limited warranty.